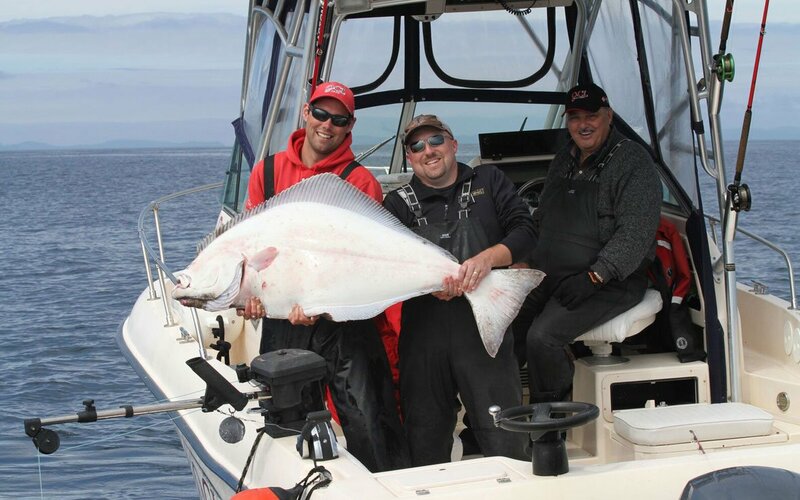 One of the most exciting fish for an angler to catch is a massive Halibut! In the North Pacific waters near the misty islands of Haida Gwaii, halibut thrive. The traditional home of the Haida people not only boasts a magnificent natural landscape but is also one of the top fishing destinations you can find anywhere. Imagine watching the sun rise over the ocean waters as you set out to conquer a hundred-pound-plus halibut! 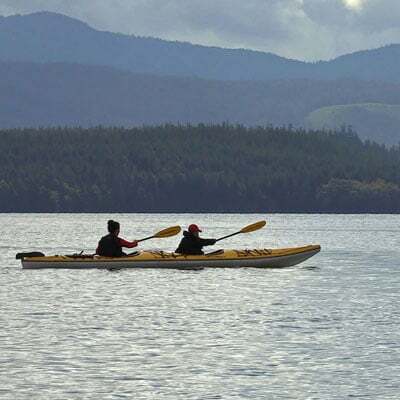 When you visit Haida Gwaii, you will be surrounded with an amazing range of abundant wilderness, wildlife, and lush green coastal rain forests. Queen Charlotte Lodge is your ticket to adventure! 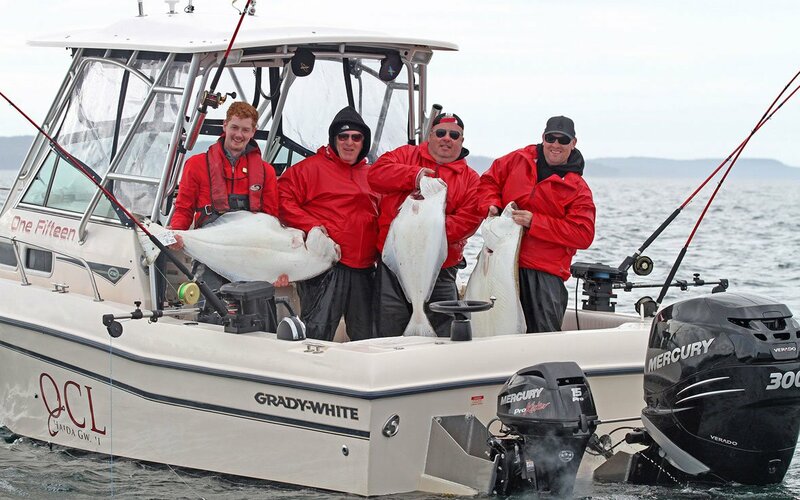 Plan your BC halibut fishing trip with QCL and experience everything this magical landscape has to offer. This is fishing Disneyland and National Geographic all wrapped in to one. Mind blown. You should go. Queen Charlotte Lodge is your gateway to adventure and the adventure begins before your arrival. Our fishing packages include return airfare from Vancouver on our very own QCL chartered jet! Once you land at the Masset airport, you will board a helicopter for an unbelievable ride to our beautiful lodge in Naden Harbour. Half the fun is just getting here! You may come because QCL is the top-most halibut fishing BC destination, but you will quickly discover the entire QCL experience is beyond compare. Queen Charlotte Lodge is the place where you can experience true wilderness perfectly blended with the comfort and warm hospitality of our first-class luxury lodge. You will be able to explore the culture, mystery, and beauty of Haida Gwaii while having the greatest angling experience anywhere! We are excited to share the wonder and excitement of this magical place with you and we know your entire experience with us will be unforgettable! Our fishing program is designed to take full advantage of all the great fishing opportunities available in Haida Gwaii. The fishing grounds at QCL are located at the gateway to the North Pacific and this locale provides some of the most consistently exciting fishing to be found anywhere! Whether you are a seasoned veteran or a beginner, QCL provides a full range of services to meet your every need. We are proud to offer a fleet of boats specifically designed for performance and safety. You can choose to fish on your own on a self-guided trip or benefit from the assistance of a professional guide on a guided fishing trip. Either way, QCL will provide you with the fishing trip of a lifetime! Your first class fishing experience includes 5-star dining, luxurious accommodations, return airfare, helicopter transfer, all fishing gear, care of your catch, access to onsite spa services, relaxing activities, and, of course, staff who are always happy to meet your needs. Food, accommodation, staff , gear and fishing are all top notch. An amazing adventure while maintaining an unparalleled level of luxury. Every detail attended to, just sit back and have a wonderful time. Can’t wait to go back! The halibut native to British Columbia is the Pacific Halibut. It is a very large species of flat fish regularly weighing in at over 150lb – the record for the largest sport-caught pacific halibut is 459lb. Being a flat fish, they spend most of their time on or near the bottom of the water and have an impressive camouflage tactic being a light colour on their under-side and dark on their upper-side to hide from both predator and prey. Halibut native to BC eat a large variety of fish including cod, turbot, and pollock, being strong swimmers, they also sometimes leave the bottom of the ocean to feed on salmon, sand lance, and herring. 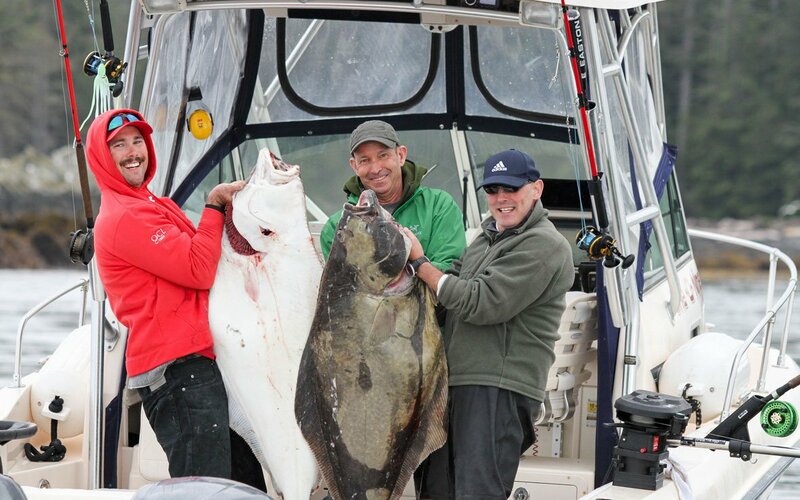 The halibut is a strong fighter making it an extremely rewarding fish to catch, here at QCL our guides are expert halibut anglers and will give you the right advice to reel in an impressive halibut. 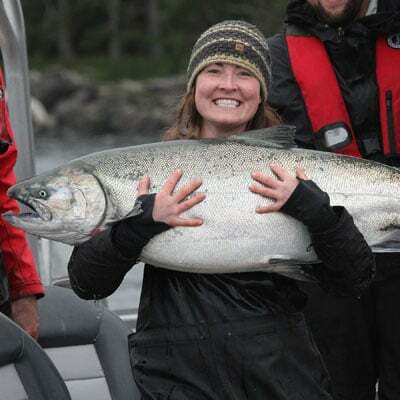 Tell us how we can help you make your dream fishing trip in BC a reality! The ultimate fishing experience means something different to everyone. It could be a misty first light of the morning heavy salmon strike. A silver bright Coho cartwheeling in the afternoon sun. A Bald Eagle swooping down to pick up talons full of needle-fish. The steady pull of a barn-door halibut from 250 feet down. Whatever your ultimate – you can find it at QCL! 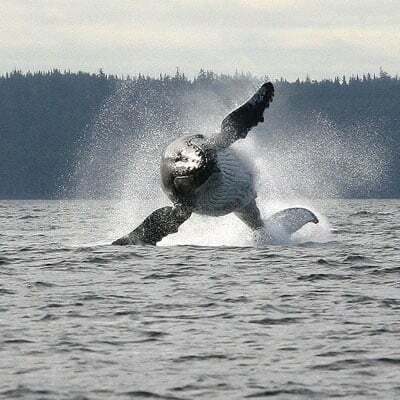 Haida Gwaii has a wealth of wonderful wildlife viewing opportunities. From the lodge you have easy access to a wide range of habitat on both land and sea to discover nature in it’s purest form! Our guides and staff are happy to point you in the right direction! As easy as it is for you to travel here, these islands have always been a remote and isolated corner of the world! 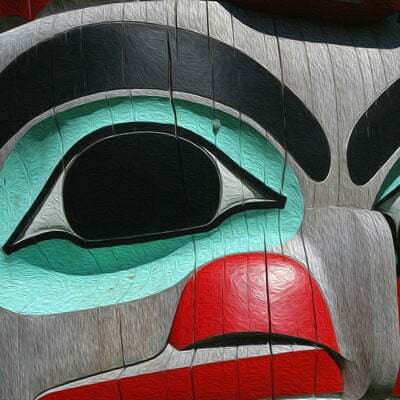 But the fascinating stories of how life has unfolded here in Haida Gwaii will spark your imagination! For a change of pace have our staff set you up with a kayak to check out the prolific estuaries in Naden Harbour. With a tidal range of 18 feet this sheltered estuary environment is a beautiful sanctuary to explore. Did you know that there is more than a 1 to 1 ratio between people staying at the lodge and staff? What an amazing experience. Amazing food, great service and best of all, great fishing. Make sure to tip the guides well for they work very hard for you. No cell reception or TV’s in the room, but that is the best part because you are there to fish and enjoy the outdoors. There’s a bar down by the boat dock that’s called the “Bell Ringer”. If you have a fish over 30 Ibs, you get to ring the bell! Great Halibut fish and chips at this Bar. Great for all ages.